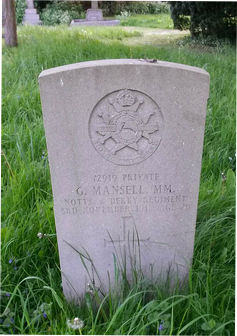 George Mansell was born in Huthwaite, Notts in 1893. He became a coal miner and in 1911 was living with his uncle in Bobbers Mill, Nottingham. In Aug 1914 he volunteered for the Sherwood Foresters (Notts & Derby) Regiment and joined the 9th Battalion (a New Army unit) as it formed in Derby. They spent the next months training Belton Park, before moving to Frensham (South of Aldershot) in April 1915. Whilst at Belton he met Rosa May Nevitt from Fulbeck and during this period he was in trouble several times for over-staying his leave. They married at Fulbeck on 15th May 1915. In July 1915 the Battalion sailed from Liverpool to Mudros, then Helles where they went into action against the Turkish army. On 7th Aug they landed at Suvla Bay and took part in the Battle of Sari Bair. In Dec 1915 they moved to Imbros and then (Feb 1916) to the Suez Canal. At the end of June 1916 they moved to France to take part in the Somme campaign. On 3rd October he was awarded the Military Medal for bravery in the field whilst bomb (i.e. grenade) throwing and rescuing a wounded officer. On 26 Nov 1916 he reported sick with shortness of breath & palpitations. He’d had rheumatic fever when he was 16, had been in hospital at Gallipoli and Suvla Bay. One report suggests he’d also been gassed. He was now diagnosed with serious heart problems and sent back to England, where he was discharged on a pension as being no longer fit for service. He joined Rosa in Fulbeck and a daughter, Betsy May Gillian Mansell was born on 22 Oct 1917. George died 10 days later and was buried in Fulbeck churchyard.